Hi everyone, so earlier this month we were given a fab opportunity to take and test some equipment from the owners of CaravannersRus and having seen the very cool SUMMIT onesie, I must say, we were very excited. 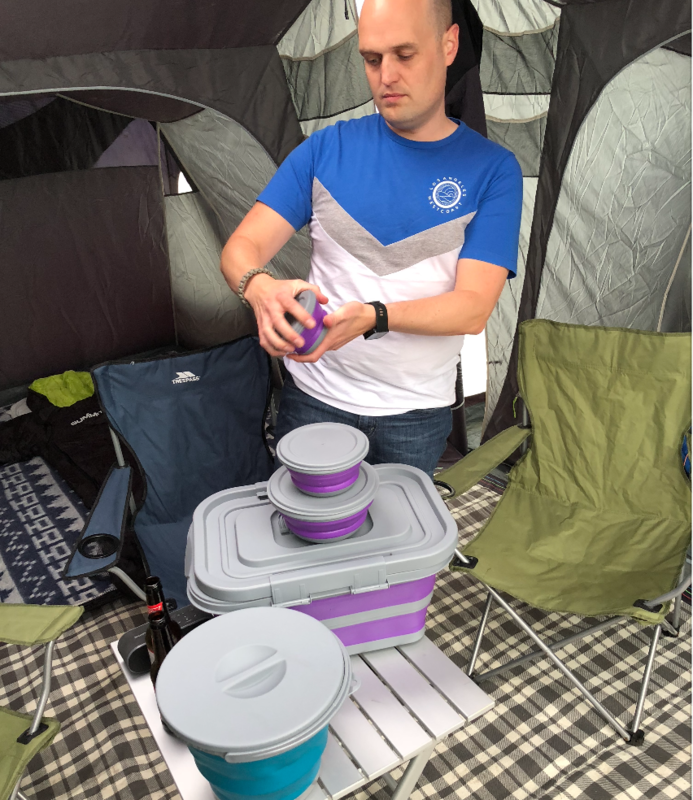 We packed the tent along with a full range of POP camping equipment from Summit and this flat pack type accessory range couldn’t have come at a better time. I threw the onesie in and a few clothes and we were off… Oktoberfest, Royal Leamington Spa Festival. Our child and wife free weekend was underway, the lads were intrigued by the new camping equipment so I kept the excitement for our arrival. We arrived promptly at Hilltop Hideaways (www.hilltophideaways.com) and the boys scooted off to check out the facilities whist I explored what we had. Firstly the tent, what can I say? IT IS MASSIVE! It was very quick and easy to inflate, three large bedrooms, a huge central social space and an open fronted porch. It is just a fantastic piece of kit and ideal for 3 lads ha. I jumped into my camping onesie and cracked open my first beer. Now onto the POP range. Initially, I didn’t know what we had taken as it’s mostly packaged and flat. Having had the opportunity to use it for one weekend, I have since visited my local Range store who are one of the POP suppliers, and invested in pretty much the full range. It is an absolute no brainer for camping/caravanning type families who are used to having to bear in mind space saving solutions for travel and comfort whilst away. What took absolutely no space in my car had suddenly turned into a large insulated cool bag, a beer bucket and several smaller containers for our snacks and treats. 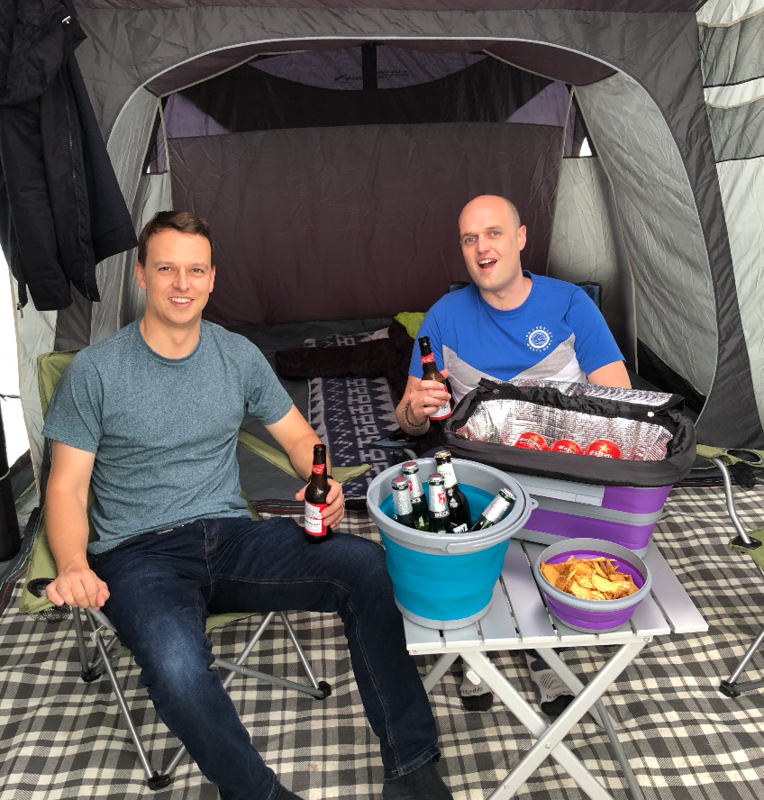 Obviously the nature of our weekend was very much about a sensible balanced diet and hydration….but I am sure there are lots of other uses for this fantastic equipment and I can see how this equipment will quickly diversify on our next family trip. It was quick and easy to wash, durable and clearly good quality, and the additional products I purchased from The Range were very reasonably priced. Finally, the very popular SUMMIT onesie. This is a onesie sleeping bag with separate sleeves and legs to allow you to basically sleep like a star fish but still be surrounded by warmth and comfort. It is very comfortable and well made and would definitely make one of my equipment must haves. My understanding is that they come in different sizes for children and adults, with a couple of colour options. I had a super warm night, I would say the one I slept in is ideal for Spring and Summer camping. We had a great couple of days enjoying live music and good beer. All in all, a very successful and enjoyable weekend. Thank you to CaravannersRus.com, Outdoor Revolution and Summit International for allowing us the opportunity to use and test your equipment.